Editor's Note: My latest tilt at windmills has led me to pitch and write pieces to publish in the "Letter of Recommendation" column in the New York Times Magazine. As I fail, I'll post the efforts here. Like any devoted Beatles fan, I cycle through their extended catalogue multiple times every year. What I hadn’t done until recently was revisit their 1970 documentary film Let It Be. There are a variety of reasons for this, among them the fact that there is simply too much Beatle source material and other detritus to sift through at any given time. But the main reason was that I didn’t remember the film being any good. As with so much of the Beatles mythology, the story behind Let it Be’s conception and production is well-known. After the acrimonious 1968 recording sessions for The Beatles (aka the White Album), Paul McCartney wanted the band to return to their roots and make a new album. The idea was to record a live performance and capture the band without the extensive studio wizardry they had mastered since 1965. They moved from Twickenham back to London to record at Apple headquarters. The full live concert was scrapped and instead they decided to play a short live set of their new songs on roof of the Apple building. The recordings and film were deemed too dark and too rough and were tabled. 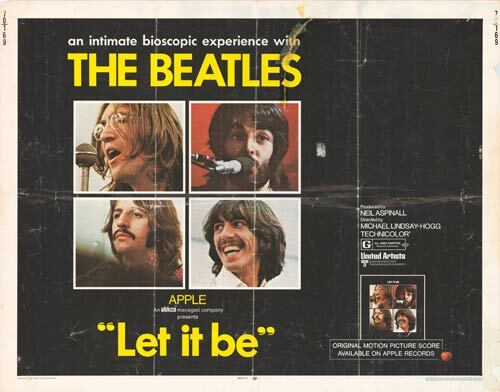 It wasn’t until May 1970 that the film and the album were released under the title of Let it Be. By then, the band had publicly and controversially broken up. At the time of its release, Let it Be was widely panned by critics. It was described by the London newspaper The Observer as “a bore” and that it was “[s]hot without any design, clumsily edited, uninformative and naive, it would have destroyed a lesser group.” Today, the movie retains its legacy as the document of a band breaking up. And it is mostly known for the iconic rooftop concert, with each Beatle trying to stay warm as they play their new songs in the frigid London weather. But in watching the film this year, it didn’t strike me at all as terrible. Aside from his scene bickering with Paul, George doesn’t seem moody or put-out. There is a specifically heartwarming scene where John and George exchange loose vocals on “You’ve Really Got a Hold on Me” and George can’t escape from smiling and losing himself in the cover. John is engaged and witty throughout the rehearsals and performances, specifically when the band is jamming on “Dig It” while Linda McCartney’s (then Linda Eastman) daughter Heather dances around the studio. Paul, as ever, is Paul—finding the camera, smiling, talking in that charming cadence that is equal parts door-to-door salesman and pop entertainer. But he doesn’t feel overbearing, more like an earnest, overworked middle-manager trying to get his team excited about a new project. What really stands out are two scenes centered around Paul and John. In the first, Paul is explaining how he’s just watched home videos of the Beatles when they were in India studying transcendental meditation with the Maharishi Mahesh. Paul says to John, “It’s incredible just to see us...There’s a long shot of you walking with [Maharishi] and it’s not you, you know—it’s sort of like, “Tell me, Old Master.’” John is off-camera but the film captures Paul laughing at him and knowingly saying, “Yeah, yeah!” Then Paul continues, “It’s like that thing you told me the other night, about going up in the helicopter: you thought he might slip you the answer.” Paul laughs and you can see the pure joy in his face as he recounts John’s quip. It’s a joke he would go on to retell in The Beatles Anthology and in other countless interviews. During the second scene, Paul is discussing the logistics of putting together the concert for the film and going over some of the band’s objections. His back is to the camera and the shot only captures John’s face. As Paul continues talking, John shifts uneasily, smoking a cigarette. His eyes glaze over and he stares as if he doesn’t recognize the person in front of him. Or, more bluntly, as if he couldn’t care less if he saw this person again. What I realized is that Let it Be isn’t really the document of a band breaking up, but actually a movie about a very famous group of friends growing up and growing apart. At the time Let it Be was filmed, the Beatles were aged between 25 and 28. They were each either married or soon-to-be married to their soul mates. John and Ringo had children. Paul was about to be a step-father and a biological father. Whether you are in the most famous band in the world or just work an office job, your life begins to change as you near 30. Friends become less essential. You enjoy spending more time on your own, with your significant other, or your kids. And sometimes if you haven’t seen friends in a while, they can seem like strangers before you remember the jokes you’ve shared—the ones you sometimes also share with other people when you tell them about your friends. You don’t need to be a Beatle to understand that what that feels like. But it helps watching them go through it just like you. Needless to say, you're likely to require a DLNA server to stream your media.worldmoviemag.com has various tutorials related to worldmoviemag. Additionally a significant number of them can get you into magazines like Indie Slate and MovieMaker to influence your film to look all the more engaging motion picture wholesalers. The site which offers watch series free access to new motion picture discharges may likewise enable its guest to stare at the TV programs on the PC.